Page-to-Stage: Adult Broadway Revue! - Mar 25, 2019 - Oak Park-River Forest Chamber of Commerce, IL ? 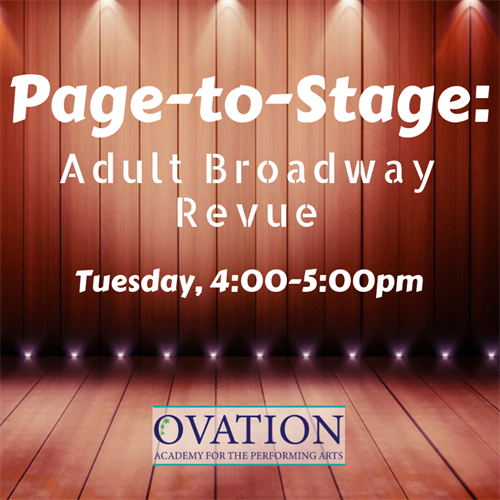 Name: Page-to-Stage: Adult Broadway Revue! Move over, kids - it?s time for the parents to have some fun! Parents, get ready to step into the spotlight (or into the ensemble, that?s okay too!!). Escape the kids on Monday evenings and immerse yourself into a world of grown up musical theater fun. During our first ?rehearsal,? we will brainstorm musicals the class would like to delve into. Group harmonizing? Dramatic scenes? A dance number or two? Solos/Duets/Trios? Wicked? South Pacific? Rent? Avenue Q? It?s up to you! Together we will create a musical revue that is sure to remind your family that you?ve still got ?it!? Mondays, 7:30-9:30 pm, starting 1/27 through 5/12.